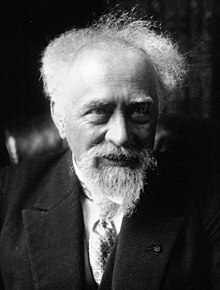 Jean Baptiste Perrin ForMemRS (30 September 1870 – 17 Aprile 1942) wis a French pheesicist who, in his studies o the Brownian motion o minute pairticles suspendit in liquids, verified Albert Einstein’s explanation o this phenomenon an tharebi confirmed the atomic naitur o matter. For this achievement he wis honoured wi the Nobel Prize for Pheesics in 1926. This page wis last eeditit on 28 Mairch 2017, at 04:25.